Global lifestyle brand GUESS, Inc. announced today the expansion of their deployment of Princeton, NJ-based retail start-up’s Radius8’s contextual retail platform. GUESS launched Radius8’s technology in 2016, replacing their traditional store locator page with a dynamic local experience where consumers seamlessly discover what items are best sellers at the stores nearest to them. GUESS is expanding this local-contextual merchandising across the rest of their E-commerce website and mobile application. 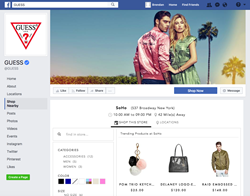 In addition, GUESS will be leveraging Radius8 to power a shop the store experience within their Facebook page. The expansion is paying off, where store-powered E-commerce enabled by Radius8 is seeing high conversion and driving an average order value that is 25% higher than the typical e-commerce transaction. Radius8’s platform empowers retailers to collect, measure, and act on hyper-local data around the radius of their brick and mortar stores, using that data to influence digital outcomes on their e-commerce site, as well as, driving greater foot traffic into their physical stores. Radius8 is the first company to leverage ‘ambient’ local data sources to drive increased engagement and online conversion. “Radius8 is revolutionizing the way we think about our stores and e-commerce at GUESS. We are looking forward to a successful 2017 using their technology,” Park said.